A long-awaited makeover for one of the city’s landmark historic buildings looks finally set to begin. The grade one-listed Temple Works building, in Holbeck, has been the subject of several stalled rescue attempts over the years, but now Leeds City Council look set to spend money weatherproofing the building while grand designs for a renovation can be completed. It is set to be discussed at the council’s executive board meeting next week, with a report going before councillors claiming the work could form the centrepiece to Leeds’s wider south bank masterplan. 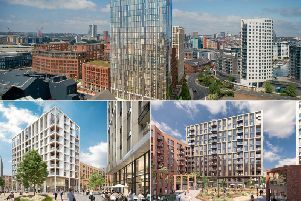 A report going before Leeds City Council decision-makers claims work on the site is overdue, and that the authority should help its new owner Commercial Estates Group. It said: “There is understood to be a significant conservation deficit associated with bringing Temple Works back into use – the cost of the repairs exceeds the market value of the asset once repaired. “Because of this, a conventional development at the site is unviable and public sector intervention is required if the building is to be saved. The 19th century former flax mill once boasted the largest room in the world and has a striking Egyptian temple-style façade. It lies at the heart of proposals for the South Bank Leeds regeneration area. It suffered a major structural failure in 2008 when part of the roof and frontage fell in. Until June 2017, the site had been earmarked for a new £50m manufacturing facility for fashion giant Burberry. However, the company pulled out of the deal, claiming it would be too expensive and time-consuming to renovate the building. Last November, the previous owners put the building up for auction with a guide price of £1. The evening before the auction was due to take place, the site was bought by CEG. The report claims that, since buying the building, CEG have undertaken several works to secure the building, including scaffold recertification, new external propping, clearance of contaminated materials, new lighting and installation of fire signage and equipment. The council says it now needs to support the building with urgent weatherproofing measures, and is expected to provide around £100,000 of the total £400,000 cost. The authority says it will pay for this using money from selling land it owns around the site, at Sweet Street, Bath Road and Leodis Court, to CEG. The report also suggests the authority provides £560,000 to create a public space in front of the site once restoration work is finished. Although the final usage of the site is unclear, it was at no point in the report suggested as a future home of Channel 4. Councillor Judith Blake, leader of Leeds City Council, said: “No-one should underestimate the importance of this incredible structure in both architectural and heritage terms. Not only is Temple Works one of the most important buildings in the North of England, it is a proud part of Leeds’ industrial history.